The mango season came this year and has already almost gone. Summers for me has always been synonymous with the love for mangoes. I remember soaking them for few hours in water and then chilling them to devour after lunch and dinner. Yes, two times a day. I have always loved mangoes. For us the season to relish this fruit starts with the arrival of Langra. It is the most loved variety in my house. We do compromise with the taste of a Dussheri but that is when Langra has already bid farewell. Every year I look forward to all the yummy treats I can whip up with the King of fruits. But this year, mangoes arrived and I just did not feel like picking them up. The reason being last year Vaanya, my daughter, fell sick and developed rashes all over her body and we believed that it was the heat of the mangoes that made her sick. Only at the fag end when the mangoes are bidding adieu with the promise to come next year, I decided to put my hands on a Mango cupcake with Mango Buttercream frosting. I spoilt one batch of cupcakes due to my over enthusiasm of putting too much fresh pulp in the batter. For the next batch I decided to reduce the moisture from the mango pulp by cooking over low heat. This yielded me cupcakes full and bursting with the mango flavour. And I decide to get overboard with the flavour by adding some of it to the Buttercream frosting as well. I had made some Mango sandesh which I reserved to make some cute decoration to beautify my cupcakes. 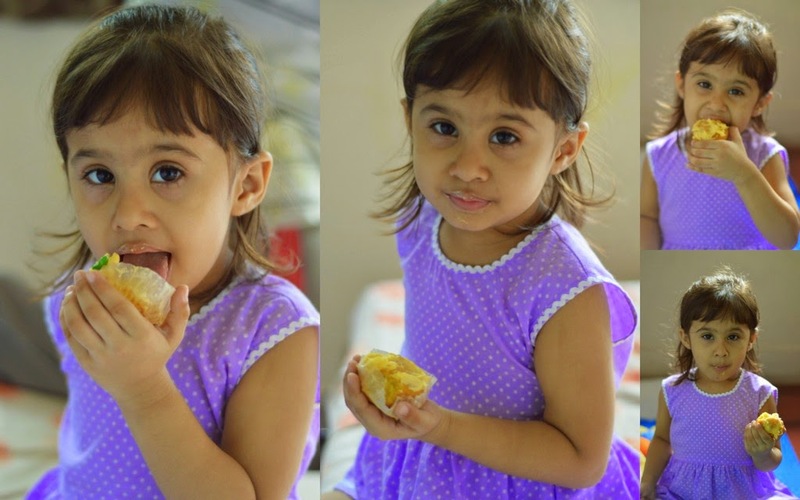 After clicking pictures, Vaanya leapt on the cupcakes and gave me the best compliments in her toddler language declaring them to be 'Delicious' and kept saying 'yum yum' throughout. Luckily with my camera beside, I could take some lovely shots of the beautiful moment. Prepare mango pulp by peeling and chopping the mango and processing it in a mixer. Do not forget to strain it to remove any threads from the fruit. Take this pulp in a non stick pan and mix with 1/2 the quantity of sugar i.e. 2 tbsp. Cook over low heat, stirring continuously, till the mixture thickens and reduces to half the quantity. Keep aside and allow to cool. Preheat oven to 180 degree Celsius and prepare cupcake moulds with a cupcake liner or simply grease and flour it. Sift all purpose flour with the baking powder. Add egg and flour mixture to the butter-sugar mixture and mix till incorporated well. Do not overbeat. Pour the batter equally into the prepared moulds till 3/4 full. Bake for 15-20 minutes or till a toothpick inserted in the middle comes out clean. Mix butter and icing sugar very well. Add a tsp of the reduced mango pulp and mix. You may use fresh mango pulp too. Add more if you want more colour and flavour. Transfer to a piping bag fitted with a star nozzle and refrigerate for 15-20 mins to set and for the flavour to enhance. Take it out before piping and allow to rest for 5 minutes. Pipe on the cooled cupcakes and decorate with a flower and leaf decoration made out of Mango sandesh. Check here how to make Mango sandesh. I made the flower by pinching four small balls together and shaping them as a flower. For the leaf, I added a tiny drop of green food colour to the mango sandesh dough and shaped as a leaf. Use 1/4 cup of fresh mango pulp in the cupcake batter instead of cooking the mango pulp. Do not add any water while making the mango pulp. And do not add too much of the mango pulp to the batter as too much liquid imparted by it will hinder proper baking. You may take the cheats way out and make the flower and leaf decoration with mashed paneer. Add food colour of your choice. You may enjoy the mango cupcake without any frosting too. they look delicious! pinning them. Hey thank you for liking them. I have been forgetting about pinning my posts. Thank you for the reminder. looks very tempting & delicious...yummy!!! I was wondering if there was someway I could make this eggless. Hello Ritu. Thank you for visiting and liking the recipes I love to share. I am personally not into eggless baking and have never tried them, though I keep telling myself to try them at least once. I have a basic eggless cake recipe that you may try for around 5-6 cupcakes. Take 1/4 cup yogurt and mix it with 2 tbsp powdered sugar. Add 1/4 tsp baking powder and 1/4 tsp of baking soda to it. Sift 1/2 cup flour and add to the yogurt mixture. Add 1/4 cup oil and mix. Add the reduced mango pulp as described in the recipe above. Bake for 15-20 min. Hope this helps. Please do leave in your feedback after you try. Hello Amrita, What lovely cupcakes! loved the pictures of Vaanya enjoying them. It is such a beautiful feeling when kids love what you make for them. One compliment from them makes all the efforts worth it. Fantastic cupcakes, feel like licking that buttercream frosting, hard to resist..